it has took some time but al least, here she is: my bass. I baptised her "Bonnie" after my music "godess" Bonnie Raitt. - the capping is Dark Walnut. Because I live in Belgium and there was no way to choose in a woodbank Mica did the wood-selection. She told me that time (and confirmed it a coupleof weeks ago) that it's Claro-wood: a Californian member of the walnut-family. - Also the peghead is that wood I think. On the picture you can see it's one piece and heavy flamed. Also the body has this "flames" but that's less visible on the pictures. There is a "gold" logo, plain standard. - the body is dark-walnut, maple, mahogany, maple, dark walnut sandwiched. - there are no led-sidemarks just brass marks. - The body has a "Omega" cut-out but this cut-out isn't of the really "round" type you see on other Alembics. It's more "oval" and therefore the guitar has a more "Manta" look. - The neck is standard in the way that it has maple/purple heart laminates but is not standard in the sense that he is much wider than standard. Generally the Alembics keep their "sleek" figure because the not wide neck (f.i. look at the Jimmy Johnson one). This guitar has a more "stout" look and is overall wider than standard. Beware: there is no balance problem, if you hang the guitar on a strap only at the upper strap-fixing she hangs in perfect balance, the neck slightly upwards. What else is there to say ...not much, she sounds very nice and is a comfort to play. After being together for 6 years there are small bruises and points the high gloss finish going "matte" but I don't care. Being alive and in music leaves bruises on minds, souls, hearts and ...instruments. Thanks to the Alembic people who made her ("breed" her). Thanks to Mica for making the good choices. A sister for her recently came out of the dreaming fase into the sketching fase (see the thread on that purpose) but will not be possible in the near future. They were made with a 200mm and a 70 mm lens. I did this because wide angles often bias the "look" and the proportions of the guitar. Another thing to know: I took the pictures in the late afternoon and that gives a colour bias: the guitar is not THAT yellowish. Best results for colour is taking pictures of guitars outside at noon on a bright -high clouded- day. NEVER use a flash, most -even small/pocket- camera's have a knob to disable the flash. You better improvise a tripod to steady your camera. I love her Paul...Bonnie is a real "Beauty"!!! She is great looking Paul. 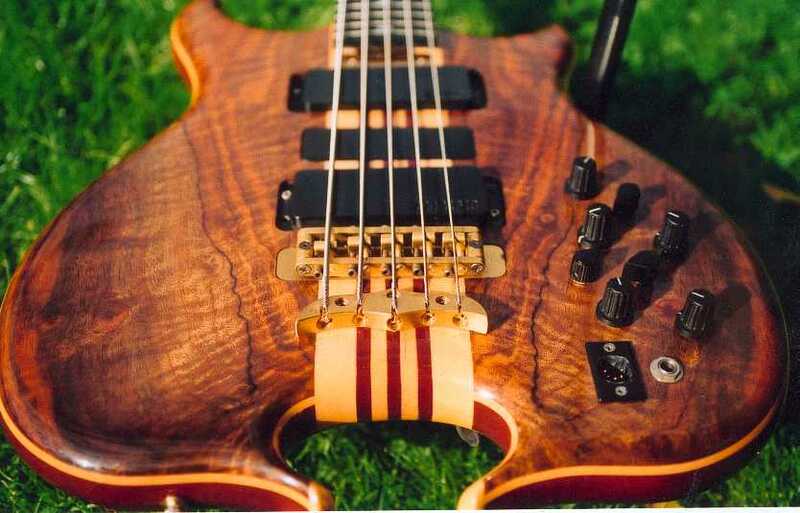 I'd have to say that your bass is in amazing condition after having survived 6 years of playing and gigging. It's inevitable that she's going to have a few "battle scars". But from the look of the pics she's been loved her whole life. thank you for the compliment about the care I have for my guitar(s). Just an example: I still own my Yamaha FG 580 acoustic steelstring. In Yamaha history it's a "high-end" model (well, the "lowest" in the "high-ends"). I bought it 26(!) years ago. We're still togetheter and the guitar is sounding better than the start! I have professional guitar-players coming along who are realy astonished by her full sound. I have guitar-tech controlling her every 2 years and he can't believ his eyes that the guitar has that age. I payed here about $400 at the time, he estimates her $2000 now. At least he says that will be the price for it's equivalent. So Matt, I'm really caring for my guitars. PS: I know there is a "sandwich" threat going on somewhere her and a wood-discussion. 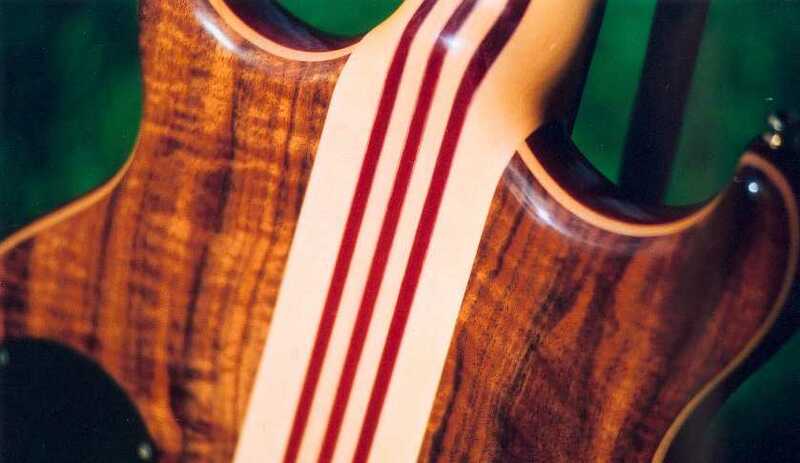 The sides and back(bookmatched) of the Yamaha are in absolutely beautiful Jacaranda, it's a Brazilian type of wood of which I heard that the export is stopped. I heard recently that "Jacaranda" stands for Brazilian ROSEWOOD. I'm not sure of it yet. That is a beautiful bass Paul! 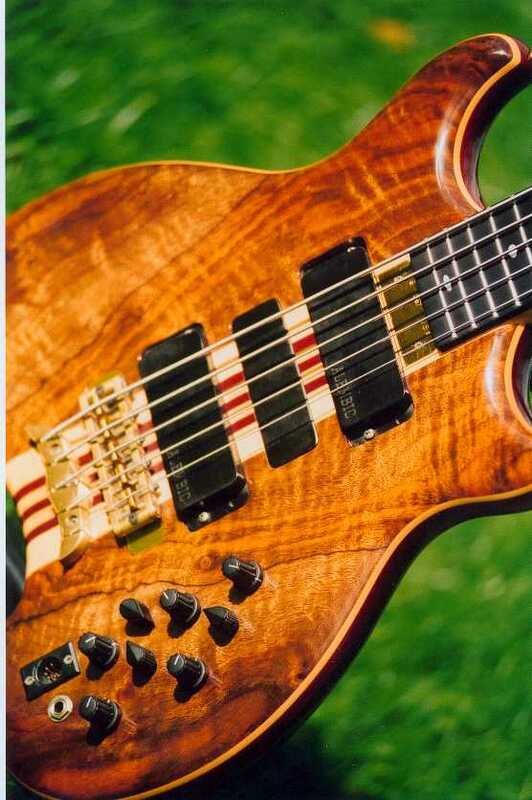 there are less knobs than on a car, but more than on an ESP (HA). I WAS lost in the start but than I started to think as playing a Gibson Les Paul or my worn-out Ibanez hollowbody jazz-guitar. I just added the master volume. So the two PU-volumeknobs are coming in mere as tools for tone-shaping. I think that is the secret of playing S1 and 2's: adding the volume-knobs as part of the "tone" department. Well, we discussed it before my friend, we alembicians are kind of "knob-tweakers". 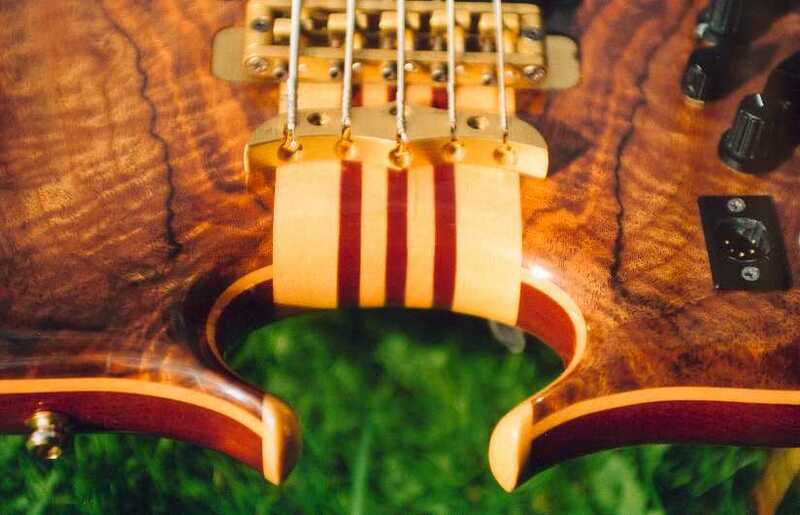 Of course, you can turn the whole bunch to "full" and tweak a bit on your amp but then you should buy the "ultimate" Alembic: a beatiful crafted guitar with the most sounding and stylish woods with fancy inlay-work and ...just 1 Pick-up, NO KNOBS! I tried to get close to this concept by "dreaming" my "humble bass" (see the "dreaming" department) but I still couldn't let go some knobs to tweak! Beautiful Bass Paul! A five string is next on my list . . .
Kaalkop ...moet jij niet dringend wat basjes gaan verkopen???? 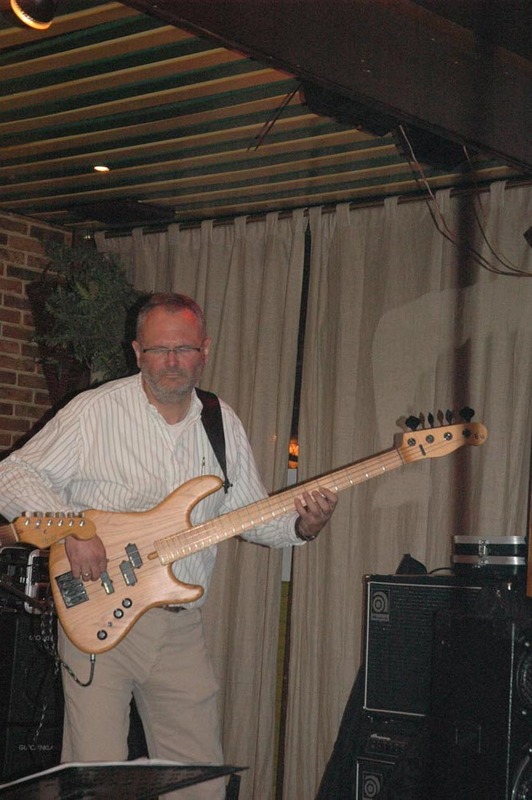 Baldhead ...aren't you supposed to sell some basses? Oooooooooooh - ladies, get your handbags out! Handbags at ten paces - let the duel commence!!! Hey Roger, you have a TVR? They build them just up the road from me in Blackpool and a friend of a friend actually builds the engines I believe (if only they built alembics up the road from me...but no, that'd be too dangerous). Please excuse my ignorance on this but... Just for my own curiosity, what is a TVR? Paul and Edwin!!!! Play nice!!!! HA!!! That is beautiful!!!! Thank you Dave for the link. See, I learned something new today. Now I can rest!!!! Nice to know of the hints for good photos, thanks. well "complaining" I hope there will come a time that the OOOOOOOOhhs and AAAAAAAaahs are for my playing (I know ...I'll have to practice). I know one trhing for shure: they will never be for my "bautifull being me" HA!!!! PS how is the boat trip going??? I imagine you will not be home for christmas in Turku??? you'll have to check this page for the unveil of Bonnie's X-mas present but ...a little patience for that. After almost 9 years being together Bonnie dared the step on the bathroom-scale. For those who were wondering about her wheight???? Between 7 en 8 kilo ladies and gentle people !!!! (okay-okay ...a bit closer to the 8 than to the 7 I think). That means ...oh ...huh ...15.4322 pounds!!!!!! Wow! What gauge stings are you using? Even heavy she's still beautiful, Brother Paul. Heavy although ...brother Bob ...-you know ...the sailing dude who is temporary not available right now- send me a mail to check urgently my bathroom scale because it seems just impossible! Mmmmm ...makes sense because all feminine members of my family went on a diet the last weeks HA! I have to find a way to y�&�!��"���!�� check that weight! Am I missing something? Or maybe that beautiful claro-wood top adds bouyancy - sort of a helium effect? P.S. I just noticed the reference to Bonnie Raitt as your treasure's namesake. I've been fortunate to have seen her live numerous times. She rocks! It also reminded me of one of my favorite bass players, (and certainly my all time favorite bass player name), her bassist in the early days: Freebo! Any idea what became of him? 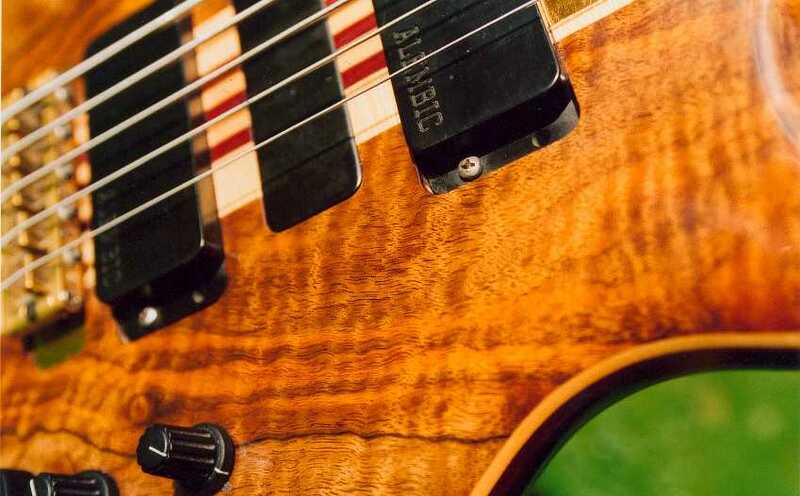 That is an Alembazingly, Alembeautiful, Alembincredibley, great looking bass. Outstanding choice of wood(s). Oh yeah, credit to the photographer. Ho yes ...I REALLY like hil a lot. He was of great influence on my bass-playing. I send him a mail and he answered! Not into bassplaying for the moment anymore. He is a singer-songwriter. Okay. I'm looking for information on flashing the ROMs in my '03 Dodge Ram 1500, so as to hopefully tweak my shift points and improve my mileage. Something tells me that by the time you finished reading the previous sentence you already had the best url in mind and had begun typing. If you don't post it now, I'm sure it's just out of humility. While the Freebo url may have been fairly straightforward, we've all benefitted enormously from your command of the web. You are amazing. I never get tired of seeing pictures of Bonnie, she's a masterpiece for sure. John; you had me rolling on the floor laughing!! Thanks!! I think "amazing" doesn't really apply; it's more a function of spending way to much time on the internet while the stuff I get paid to do is piled up on my desk. Hi there bro's and Sis's all over the world sharing the sound of the deep frequencies, slapped, plucked or popped! I just hop in short to wish you all a very happy new year! All sort of woo's are keeping me away of posting and visiting this jolly club! Bonnie was suspected in deep electronical troubles but that (lucky me) didn't seemed the case. OTOH the troubles were located ...in my rig. The combibation of the DS-5R, F1-X, SF-2 and the new QSC 3002 PLX was not that good. Something is really giving a nasty distortion. Whatever bass I use, I seem to sound as an old JAck Bruce with extra overdrive. I hate it! Help is on his way (Edwin from the Bass Connection is supposed to hop over one of this weeks) so I see light at the end of the tunnel! Believe me ..."i'll be back" (mmmm ...who said that too? THat Califostrian dude ....what's his name ...). Paul, it's good to hear from you. You've been missed. I'm glad that Bonnie is doing fine. How have you been? Give my regards to Edwin when he makes it over. I hope the new year is good to you and the family. I've been wondering when you were going to stick your head in the door. Don't be such a stranger, this place ain't the same without you. No one else can demand photos and bang their beer bottles on the table quite like you! LOL. A very healthy and happy New Year to you, Bonnie, and Broomstick! Welcome back, your writings have been missed. I hope all is well with you and family. Bonnie is always such fine sight, the planets must have been in rare alignment for her creation, truly a timeless beauty. Again,welcome back. As I said "I'll be back" ...soon. Yes Bonnie is in good health though I didn't play her the last ' months because she is simply not with me. I brought her to Edwins store for checking her up and testing and that's why I know my sound problems are situated in my rig. Simply because Edwin is now playing her almost everyday (testing ...huhuuh ...yeah right ...he's just showing off hehehehe). Broomstick is ...well ...Not really "Broomstick" anymore. she is a fretless bass now with J-retro 01 guts, a Badass bridge etc. Unfortunately the Squier PU's are really bad. The last step will be: changing the PU's. Yeah yeah ..then pictures. I call her the G-bass. G-force or somthing. Also called to girl I Loved very much. I called her "the A-bass" or just "Alfa". Part because it is the most "basic" bass , the start of all basses. Part to another girl I love very much and kept me playing bass when times were rough. I will post more pictures later but I just want to say now that it is an amazing instrument. 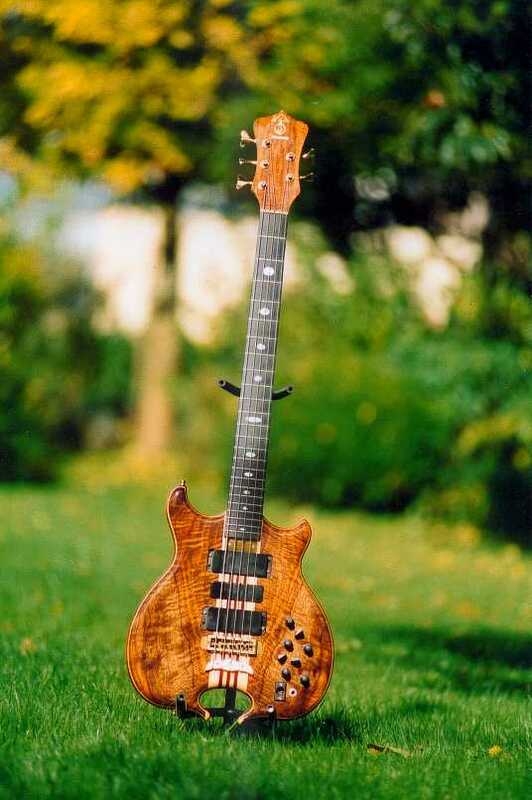 Alembic VPFQ with PJ PU's. Mica was so kind to send me the old hat-style knobs to finish her. The body is figured Ash I think, the neck is bold on but laminated with purple hart, the neck is figured maple, the fingerboard is maple with mandolin frets and a "compound radius" (the fingerboard gets flatter more to the body). 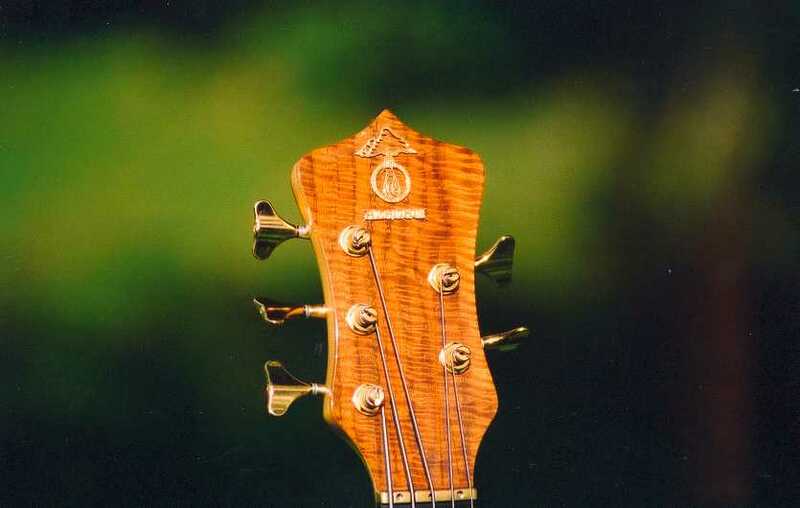 Schaller tuners, ABM bridge,24 frets long scale, position markers only on the side. So ...that's all about me for this time folks. See you all back at the other side of 12-31. PS: the Ampeg was owned by the house band and in bad shape. I didn't play that one. I played my rig ...with all the fuzz and hiss it produced but I managed. BTW, it was a gig ON A SUNDAY AFTERNOON AT 1500 in Antwerp, "Caf� 't Hofke" and it was really a GREAT gig. Could you believe, for playing the blues I ma in great shape! Must have been something to do with having those scars on my heart and mind! 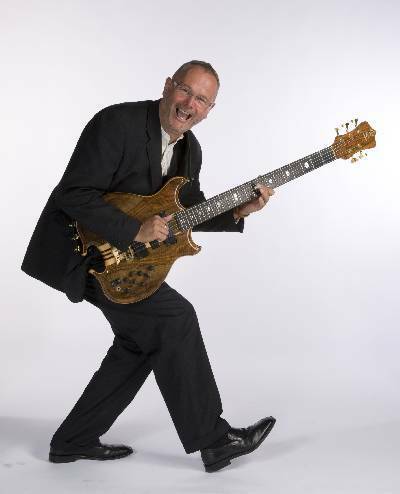 What I love about this photo - aside from the expression on your face - is the shadows from the tuners. It makes it look like you're playing an 8 string, or at least 7.5! Great to hear that Bonnie is fine, and hopefully your rig will soon be sorted out. Happy New Year to you, my friend (and everyone else here, of course). Welcome back, and Happy New Year to one and all! This morning I found Bonnie in good company - surrounded by lots of close relatives in Ed's shop in Hilversum. She looked a little quiet, must be longing for TBO. En heb je erop gespeeld? Well ...IFF all goes well she will be back here in the weekend of the 28th of April. Than I can sort out with Edwin (who will bring her) if there are any problems left with Tweak Peaks. As I told on another threat we recorded live in a bar and ...TWEAK PEAKS SOUNDED GREAT with the A-bass. Now we're going to check if she can handle that B-string of Bonnie. Feel free to hop over whenever you want! I was at Edwin's store to try out the NS WAV pole bass (and bought it) but things were a little busy, so I didn't want to impose too much. He keeps the Alembics on the second and third line of stands, and on the wall, so you can't just pick one up easily! By the way, you do remember to turn the Aural Exciter down to zero on the SWR? It worked wonders the last time! I use the AUral Exciter very sparsely now! The SWR SM 400 I use for the "small" situations with the DUO from Glockenklang. It's not an easy amp to master but ...Well ...I simply love that old lady! THanks for that extremely good advice! BONNIE WILL BE BACK AT THE 28TH AOF APRIL! LET's come ovehee and have a welcomehome party! Great news, Paul. I may not be able to get away from work that day, but should you hear the sound of a beer bottle banging on a table in celebration wafting over from the direction of California, that will be me! Anyway, I didn't get to play her - had to get back home early. Perhaps we should organize a gathering of the Lowlands Alembics? How about all coming this way the 28th of April? Edwin will be here ...I hope ....WITH Bonnie ...I hope! I guess it will not be that impressive as those dudes at the West Coast over the pond but ....hey ...let's see what we can come up with for the first time! It's ALC time : Alembic Lowland Chapter! Nothing wrong with the lady! It seems that the 15" Glockenklang speaker was blown! Partially: he added a tremendous hiss on the low (B) sounds! Have fun getting reacquainted. I've always loved the walnut top. LOVELY. Congratulations on Bonnie's return home, Paul. Her good health is the "Silver Lining." Enjoy her for years to come! Congrats Paul! The bad bass is home. All is well with the universe. Enjoy, brother. Paul, enjoy your "re-learning" of her neck. yep ...great to have her back! Pplaying whenevr I have the time and I even invent some time to do so! Mike indeed ...there is some re-learning to do! My speaker is now to the repair-dep but I am afraid it will be a new one! The are placing a Neodymium 700W by 8ohm from Beyma in the Glockenklang box and add one more bass"hole" to compensate for the higher pressure! WHat the consequences are going to be for the Duo I dunno yet! Next week I am invited to go to the repairshop with my complete rig and things will be measured! Happy I found my boss prepared to "sponsor" this in a way (I am co-mamaging teh company now for one year with him and results are good). For me it would be unaffordable! Yes ...there IS some silver ligning!! I hope I will have more good news to tell you all in a couple of weeks! Bonnie with cleaned up Rig back on stage the 2nd of June in Caf� ZEBRA! question: what was wrong with the bass?,im trying to avoid reading thru the whole thread! Paul wrote: "Nothing wrong with the lady! It seems that the 15" Glockenklang speaker was blown! Partially: he added a tremendous hiss on the low (B) sounds!" just a short note to give word that I'm still alive! With some narcissistic pleasure I present you a new shoot result from me and Bonnie! She's all well you know! Brother Paul! Great to see you and your lovely companion, Bonnie. You just can't fake a smile like that one. Good to see you back in action! Brother Paul, that is a great photo! Don't be such a stranger. You'll have to change your name to Paul the missing one. That is priceless! Congrats Paul! Looks like you're thumpin' on Bonnie Chuck Berry style. "Roll Over Beethoven"
Just kidding ;-) That's a really good photo. it was an idea of the photographer that "Chuck-Berry-styled-pose". The picture is for our business website. They made me Managing Director of the company where I restarted after my own company going out of business. My idea for on the new website was that every member of the personnel brought something to the shoot that really defines his live and says something about him/her as a person. So ...that's obvious in my case! Without bass I wouldn't be me and the way around! I agree that there are other basses I could have picked out of my tiny collection but ...well ...Bonnie meant and still means a lot to me! So Broomstick -well ...it isn't really a "broomstick" anymore seen the pimping I did on that bass- isn't really jealous you know! By the end of october you'll find the total website finished at www.faro-com.be AND ...in english lingo! Thought it was time this thread was pushed to the top of the pile. I'm really going to miss Paul. he always had a comeback for whatever daft comment I made. Always a favorite and a reminder to us all about the preciousness of the moment and to enjoy each and every one. Good call Kenn, Danno, Bill, and Graeme. I miss "The bad one"'s eclectic, witty posts and think of him every time I visit here. Saw there was a new post, so I clicked & started dragging down. Ran out of scroll bar right at the duck-walk picture, with Paul's post starting "Just a short note to give word that I'm still alive!" Yes, I'm crying a little. That picture is priceless - a man and his bass = pure joy. friend back to the top..
One of my favorite Alembics..
thanks for remembering... cheers to Paul everlasting presence! That picture in post 2545!